Jennifer Serravallo is the author of Conferring with Readers and Teaching Reading in Small Groups . 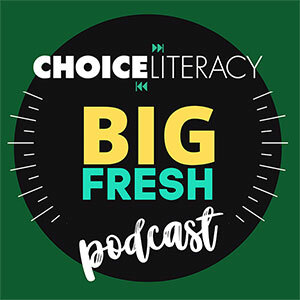 In this podcast with Heather Rader she talks about the joys and challenges of grouping students for reading instruction. A full transcript is available below the player. Heather Rader: At the opening of your book you wrote about an awakening of a sort in your third year of teaching when you stepped back and asked yourself some tough questions. How would you describe your teaching of reading in small groups then and how is it different now? Jennifer Serravallo:I was a little muddy. It’s not always how guided reading needs to go, but I was a little muddy around how to introduce the text features, the vocabulary, the plot, the things that they needed to navigate in instructional level text and actually supporting the reader and the work of a reader. And now I think with strategy lessons, which have become much more common for me, especially past first grade I would say in first grade still you know guided reading and strategy lessons are both pretty common; but beyond that, second grade and above, strategy lessons are much, much more common for me and I feel like there’s much more of a sense of teaching the reader and reading strategies than teaching the book. I also think that the kind of the pattern of the lessons changed so they’re much shorter, you know seven minutes start to finish. There’s a swiftness to them, moving around from child to child, coaching them as they work, and there’s also a sense that we’re gonna repeat this lesson over time by taking a bit of scaffolding away each time and making the child more and more independent. And that — I think the biggest difference is the shift in thinking from I’m gonna be working at the child’s instructional level to working at the child’s independent level and really believing that even though it’s independent, even though it’s an independent level, there’s still a lot of work to be done. So really helping to strengthen kids’ work within their independent level has become a really important part of this. Heather Rader: Yeah, that’s really clear. There’s a lot of shifts there from then to now. So just to give a common context for listeners, how do you differentiate between guided reading and strategy lessons? Jennifer Serravallo: So I — I follow the Fountas & Pinnell 1997 Guided Reading definition of what guided reading is. Jennifer Serravallo: It’s pretty different. The structure is different. So in a guided reading group we’ve got a 20-minute lesson where there’s a long book introduction I alluded to a little bit in my last answer. We’ve got introducing the text features, perhaps the plot, activating prior knowledge, giving some key vocabulary, giving them a question or a focus for their reading, and then finally the kids start reading maybe — it could even be 10 minutes into the lesson. Jennifer Serravallo: That’s when they start reading the book and the teacher’s coaching as the child is working. In the strategy lesson the structure is such that I start off with a strategy, within 60 to 90 seconds the kids start reading and I move around and coach them. Most of the time is spent with them reading and getting support and feedback from me and then I end with a clear link. The materials are different. The guided reading lesson is at the instructional level and all the kids read the same book. Jennifer Serravallo: The strategy lessons at the independent level and typically it’s with a book that the child has chosen him or herself. So kids within the group could be at different levels — different reading levels in a strategy lesson, but in the guided reading lesson they need to all be at the same level because of the materials. The timing already I talked about — 20 minutes versus 7 minutes; 10 minutes with a strategy lesson, and I think the purpose is different. They’re both very valid small-group structures, but I usually recommend that teachers think about why would you be pulling these kids in a group and then pick a message to match that purpose? So if my purpose is all right, these kids have been at a level for a while, they’re not moving on their own to the next level, I keep you know I try a running record at the next level higher or have them read a book I know at the next level higher. It doesn’t feel like they’re equipped to handle it, but they’ve been at this level long enough. Maybe I’ll give ’em a guided reading lesson or two or three or four and kind of give ’em that little extra push into the instructional level so that that may soon become their independent level. But with a strategy lesson my main goal is to support the work of their independent level, just like with conferences in the reading workshop. So I’m trying to shore up those skills in the independent level, and I think that’s most appropriate for kids who have just moved to a new reading level or even have been there for a short period of time. I think instead of introducing the whole next level, just try to figure out how you can support the work that they’re doing right there in that independent level. Heather Rader: Mm-hmm. Yeah, that difference is really clear between the two. So you have some ‘shoulds’ in your book about small group instruction, and one of them is that small group instruction should follow predictable structures and routines and you talk about these different parts — connect and compliment; teach; and the most important — engage; and then finishing up with the link. Can you describe a recent small group that you’ve led or maybe you’ve observed and bring those components to life for us? Jennifer Serravallo: Sure. So let’s say I’ve noticed based on my assessments that I have a group of students who are struggling a bit with articulating the main idea. What I discovered is when I asked them to tell me the main idea they’re more likely just to tell me a main topic of a page or of a book. Almost like an individual conference that I’m having with each reader in the group. So maybe the first child tends to just name the main idea based on some of the text but is ignoring the pictures and the text boxes. So I might prompt that child to say let’s look at the whole section. Here let’s look at the other parts that we’re not paying attention to and see if we can revise the main idea and with a little nudge maybe the student is able to do that. Then I might move onto the next student and the student is still just naming the topic, so I name what she’s doing. I say “Well that’s the what, and now we’re gonna have to think about the so-what. What does the author want us to know about that topic?” And I try to make sure that my coaching prompts are specific to the strategy but not the book. So I’m not talking about whales or the desert. I’m talking about the work she’s doing so that she can be — she can then transfer these to other texts. So she approximates it, let’s say. It’s not perfect, but I tell her I’ll be right back in to check with her on it again. I go over to the third student who I prompted to name the main idea and with no extra support the student was able to do it. So my prompt for that student might be — just be a compliment. I might just say that’s right. That’s the main idea because it has a topic and the author’s idea about the topic. So then I go around maybe one more time to each student and I try to circle back more than once because that way you catch them in the act of practicing the strategy in more than one place across the text, and that support with repeated practice I find really helps to solidify the understanding of that strategy. And then after I’d circle back around one more time, I pull the group back together and I end with a quick link, which is when I would remind the students what we worked on and that I’m expecting them to continue practicing on their own. And if I have a plan for when I’ll see them again, maybe you know two days later again in a small group, I’ll mention that then so that they know what to expect and when they’re being held accountable for this work. Heather Rader: That’s great. You know that fits so much with what I believe in, in starting with the strengths-based approach, you know the compliment on what they’re already doing and then you know the group piece to make it really clear and explicit and then the individual piece so that it fits you know exactly where they’re at with that book and then connecting back that this work continues and goes on. Jennifer Serravallo: Yeah, I think that starting with the strength thing is so important because a couple reasons, one — it helps the teacher keep the teacher in check, like is what I’m choosing to teach this child really within their reach? So if you’re starting from a strength and you’re saying this is just a little extra something more, then that’s a check for the teacher. Okay this is something that’s really gonna work. And then I also think it helps with confidence for the students when they’re gonna try something new, because you’re saying you already do this, this is just a tiny bit more. And they feel more likely to take on the new work, instead of you know a deficit approach where it’s like this is broken in your reading. Let me fix it for you.Â [laughter]Â That’s — that tends to be less effective. Heather Rader: Right. I also loved in your book your mention of sign-up seminars. So talk to me a little bit about why did you create those and what are some of your favorite topics that kids have come up with? Jennifer Serravallo: So this idea of a sign-up seminar came from my colleague, Colleen Cruz, she’s the author of Independent Writing , and when I was a classroom teacher I tried to have a writing workshop where kids had their own choice of what topics they wanted to write about and then a couple times a year also the genre. So I’d have in my classroom kids writing fiction books, kids writing comic books, kids writing recipe books, you know whatever they wanted to write they could write. And one suggestion that Colleen has in her book is to have kids sign up for the thing that they’re working on as writers to make the small group instruction manageable and also driven from the kids’ own assessments of themselves. So I borrowed this idea from Colleen, thinking well you know I have all this openness, this ownership, this agency in my writer’s workshop; but then I found that in my reading workshop I tended to always dictate the topics of the small groups. I always gave the kids the teaching point in the conference. I was the one who was always directing what they were supposed to be working on. So I tried to get kids to start thinking about themselves as readers a little bit more, reflecting on the work that they were doing, sometimes this was a little more guided and heavy-handed. Like, for example, I might want my kids to look more closely at their habits as readers, or I might do a mini-lesson showing them how to look at a book log and compare it to the work they’re doing, or I might show them a post-it of some — that someone wrote that was an example of really strong inference and I might ask them to reflect on their own post-its and how they’re working on inferring about their characters or inferring about plot in their text. So you know I kind of would teach them ways to reflect and different kind of lenses to use when looking at their own reading work. And then I would put up these posters around the classroom and get them to sign up for something that they wanted to be a part of. Sometimes the goals were revolved around you know study goals. So if I was, for example, in either a study on mystery book clubs I might have a — I might have a sign-up seminar on: I want to make better predictions. That would be kind of the teacher language but it would say on the poster — I want to figure out who done it . . . Kids that would you know want to sign up for that would sign up for that. But then other ones might just be around behaviors, like I mentioned, like, I want to read — I find them always reading one kind of book. “I want to branch out” or “I find that I do better work in school or at home and I want to consistently do good work in both places.” So it could be about habits. It could be about reading skills. It could be focused on the unit as a study. So I don’t think it’s a particular topic that’s a favorite over another, but my favorite thing about this is seeing how invested kids get in these lessons because they’re the ones who picked it. And sometimes they even form these little impromptu clubs with each other to work on their topic, even in between the seminar session so that you get these little like break-off groups within your class of kids who really want to work with each other and they check in with each other about how their work is going on the seminar topics. Heather Rader: That’s so engaging for them. Jennifer Serravallo: Yeah it is. It really is. Heather Rader: That’s great. So if a teacher was new to small group instruction, what advice would you give him or her to get started? Jennifer Serravallo: Well I think — I think of a well-run small group like a conference with several kids. So I’d advise the teacher to feel first like his or her conferring — individual conferring was in a strong enough place, so maybe just starting to try to work with one student, practicing, listening carefully to the student, giving appropriate feedback to the student, trying to stay focused on one strategy in that whole conference, and then when it’s going well then maybe move to a group of two. It takes a little bit of — it’s a little bit of a juggle to manage two kids’ needs at the same time, ’cause essentially what you’re trying to do is you’re trying to keep them both working — not you know you’ve got three kids in a group, you work with one — the other two are just watching you. Right, every kid in that group is actively working as you move around from child to child and what they need, even though you’re all focused on the same strategy, what they need sometimes varies a little bit. So I think it takes a little bit of juggling to kind of make sure that they’re all working and that you’re really meeting everyone’s individual needs even though they’re within the group. So personally I can’t handle more than three. I don’t like a group larger than three, so I think even two for a very beginning person would be a good idea. I think a common pitfall teachers fall into is that they pull six or seven kids together and if they just feel like it’s not going well, it’s just too much to manage. The other big piece of advice I have is to make sure that you’re pulling kids together who really do have similar needs. So like I said before, there could be a variation within the group but you know thinking back to the one — the example I gave with the non-fiction main idea, right, some kids got it faster than others. Maybe their books are a little structured a little bit differently, so you’d need to, you know support them with different coaching prompts for those different text features, but for the most part they all needed to work with a main idea so that was the thing that kept them together. So making sure whatever measures you’re using to assess readers really does help you to pinpoint what’s most important to be teaching, and that the kids that are in that group are in need of that group and are also ready for the work of that group is gonna make the group go better. Heather Rader: Yeah, well thank you, Jennifer, for helping us think through this important work of small group reading instruction. Jennifer Serravallo: It was my pleasure. Thank you so much for inviting me. Shari Frost helps a teacher who has guided reading groups that have run amok, and discovers the real culprit is a lack of time for reading and writing in the literacy block. Cathy Mere puts guided reading in perspective, explaining how it works as one piece of the puzzle when it comes to fostering a lifelong love of reading in students. Gigi McAllister leads a group of boys who are just starting the novel in verse The Crossover in her fourth-grade classroom. Gail Boushey and Joan Moser (“The Sisters”) discuss how their thinking has evolved when it comes to flexible groups. The article includes a video excerpt of Joan working with a group of kindergartners. Stella Villalba leads a guided reading group of first-grade English language learners, beginning with building vocabulary.